HAS Original Formula / 100 Caps - Nature's Way®. 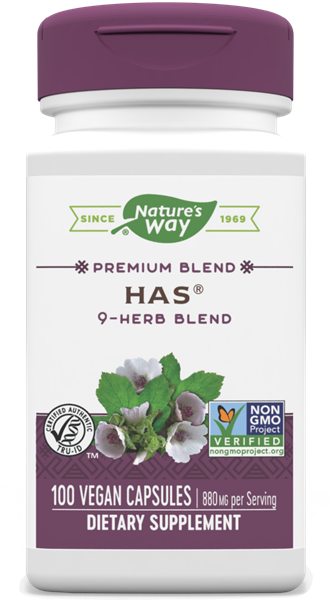 HAS® Original Blend is a 9 Herb formula. Adults take 2 capsules three times daily, preferably with food. Do not use this product if pregnant or nursing. Persons with allergies to plants of the Asteraceae (Compositae) family including ragweed should use this product with caution. If you have diabetes or are taking any medications, consult a healthcare professional before use.